1. When programming the buttons for the first time, press and hold the two outside HomeLink buttons ( , ), releasing when the indicator light begins to flash (approximately 20 seconds). This procedure erases the factory-set default codes. Do not perform this step when programming additional transmitters. 2. 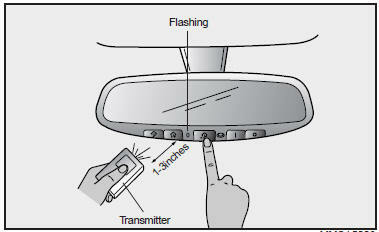 Hold the transmitter of the device you want to train 1 to 3 inches away from the bottom of the mirror. Simultaneously press the hand-held transmitter button and the HomeLink button you wish to train. 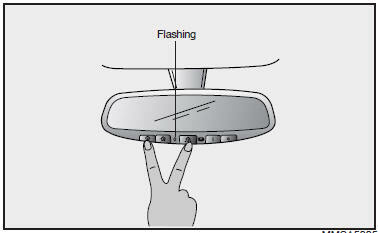 The indicator light will flash slowly at first, then rapidly, indicating successful programming. 3. If the garage door opener or other device you wish to train is rolling-code equipped, proceed to the "Rolling Code Programming" section below. 4. Repeat step 2 to program the remaining HomeLink buttons.